Out of the ashes of their “poppiest” attempts like The Head on the Door or the heterogeneous Kiss Me Kiss Me Kiss Me, The Cure reached their peak with the album Disintegration. Published in 1989, it couldn’t have been a better way to say goodbye to the prolific decade of the 1980s. I’d say that Disintegration is the perfect “winter album”, a handful of inspired songs that may be mainly remembered by the single Lullaby and its eerie video clip. However, there are other gems to be discovered in it; from the epic opening of Plainsong to the doom-laden atmosphere and intensity of Prayers for Rain and Fascination Street, or the romantic beauty of Pictures of You and Lovesong… Actually, every single song of the album is worth praising. The Cure at their best, showing a thrilling sensitivity in their sheer songwriting. 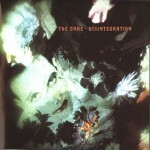 Don’t miss the chance to listen to Disintegration, or just go back to the late 1980s and rediscover it. Acceder | 47 queries. 1,332 seconds.